This is the official site for Kramer Jigs, Home of the Original Rubber Legged Steelhead Jigs and the most innovative , highest quality Salmon & Steelhead Jigs on the market! We pride ourselves in being different than the other guys and deliver top quality hand-crafted workmanship that is second to none. We use Gamakatsu heavy wire hooks to insure deep penetrating hook sets and our lead heads are powder coated to prevent chipping. We also use the highest quality materials so you can catch multiple fish on a single jig without it falling apart. Here at Kramer Tackle we go about designing our Steelhead jigs a little differently than most. We believe that Salmon and Steelhead Jigs should really look alive in the water instead of looking like a piece of fluff tied to a lead head. We have spent hundreds of hours perfecting our Salmon and Steelhead Jigs while paying particular attention their life-like appearance in the water. By adding rubber legs and plenty of flash on a jig that holds a large silhouette, we have greatly improved the fish catching ability. The Kramer Line of Salmon and Steelhead Jigs have proven themselves time and again. They work well in low clear water for very spooky fish, yet have enough of a presence to be threatening to territorial fish that wouldn't normally strike a jig. Kramer Jigs are a must for your tackle box ! Do you have a favorite color combination? 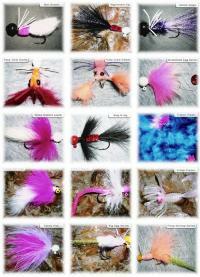 We are happy to create custom Kramer Jigs for your collection. If you can imagine it, we can build it so give us a call at (360) 349 3466 to order your Completely Custom, Hand-Crafted, American-Made Kramer Steelhead,Salmon, Bass or Trout Jigs. Thank you for your interest in Kramer Tackle. We will be greatly expanding the online store, so check back periodically. Feel free to drop us a line, we would love to hear from you.